"Let all cats old enough to swim gather to hear my words!" Reedstar called out from the branch of the willow tree in the center of camp. It was to be a good day; another warrior would be welcome in the harsh days ahead... both from the cold, and their enemies. Littlepaw ran up from the apprentice den at Reedstar's call, his eyes eyes wide with excitement. Stormpaw quietly walked up beneath the willow tree, looking over to the apprentice that was going to receive his warrior ceremony. Lucky him. He wished his would already be here. Just a little more to go. Leafstorm sat by Littlepaw, as she wanted to get a close view of this. and no, this is not because she likes him Looking at the apprentice, she purred in amusement. "Be glad, Littlepaw. Soon, your going to have to deal with more of a crammed den." She joked, chuckling. Nightbird emerged from the nursery and sat pretty awkwardly because she accidentally forgot Littlepaw(sorreh ;-;) a little way's away from the ancient tree, with tiny Ashkit running to catch up. Curling her tail around both of their paws, the new mother gazed proudly upwards with soft green eyes. The tiny white tom in amongst her tail did the same; except he was amazed by how much training one had to go through just to become a warrior. He couldn't wait to start training.. but his ceremony was so many moons away..
Reedstar purred seeing the grown apprentice's enthusiasm. "I, Reedstar, leader of RiverClan, call upon my warrior ancestors to look down on this apprentice. He has trained hard to understand the ways of your noble code, and I commend him to you as a warrior in his turn. Littlepaw, do you promise to uphold the warrior code and to protect and defend your Clan, even at the cost of your life?" he called out as the Clan gathered around the tree to watch the sacred ceremony. Littlepaw took a silent step forward, trying to keep his bushy tail from quivering with excitement. He gazed up at Reedstar with his icy blue eyes, enthusiasm shining in them as Littlepaw almost yelped with happiness. "I do." I wonder what my warrior name will be! "Then by the powers of StarClan, I give you your warrior name. Littlepaw, from this moment you will be known as Littlelight. 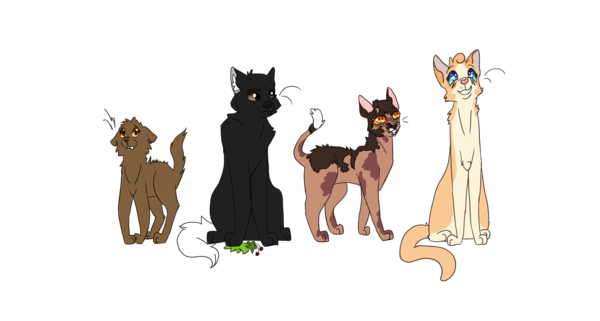 StarClan honors your energy and loyalty, and we welcome you as a full warrior of RiverClan." Reedstar said as he leaped to the floor and touched noses with the new warrior. "We're proud to have you as a full warrior, Littlelight. Nightbird has trained you well." OOC: Sorry for the delay. Littlelight felt his heart skip a beat from excitement as he dipped his head to the leader. "Thank you, Reedstar," he mewed quietly to the tom. "Littlelight! Littlelight! ", chanted mother and son. As if they were of the same mind, both padded up towards the new warrior. Nightbird purred to her former apprentice, "Congratulations, you deserve to be a warrior." While the dark she-cat said this, the tiny black-spotted tom stared up with friendliness and awe. Leafstream cheered with the rest of the clan, and came over and nodded to Littlelight in approval. "Congratulations." She purred.